A radiograph showing Golden Tie’s olecranon fracture and the locking compression plate (LCP) and staples in place during the foal’s recovery. When Golden Tie arrived at the Purdue University Large Animal Hospital for treatment of a fracture in his leg, he had already experienced a series of dramatic life changes for a young horse. 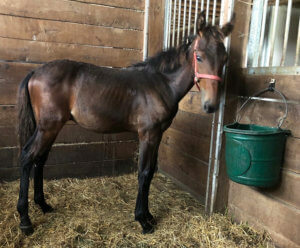 A spirited five-month-old Standardbred foal destined to be a racehorse, Golden Tie was born on a farm in northern Indiana to a beloved mare named “Ellie” that was owned by Greta and Tyler Stillings of Washington, Penn. Radiograph of Golden Tie’s olecranon after placement of a LCP. The LCP provides more stability and strength at the fracture line compared to traditional plates. Golden Tie (pictured at home) is on stable rest for the duration of his recovery. With his friendly demeanor and love of hugs, Golden Tie was a special patient during his stay at the VTH. “His gentle nature made his care and surgery much easier, especially considering the risk,” said Large Animal Surgery Resident Jase Skelton. Golden Tie was referred to the Large Animal Hospital for treatment of a non-displaced, articular, olecranon fracture, which is a break in the bony tip of the horse’s elbow. A surgical team led by Dr. Jan Hawkins, professor of large animal surgery and head of the hospital’s large animal surgery service, repaired Golden Tie’s elbow with successful surgical reconstruction using a locking compression plate (LCP). 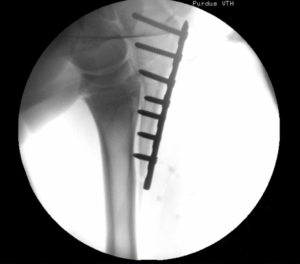 “Because of his future as a racehorse, we chose to use a locking compression plate to stabilize the fracture due to the biomechanical advantage of increased strength,” said Large Animal Surgery Resident Jase Skelton.